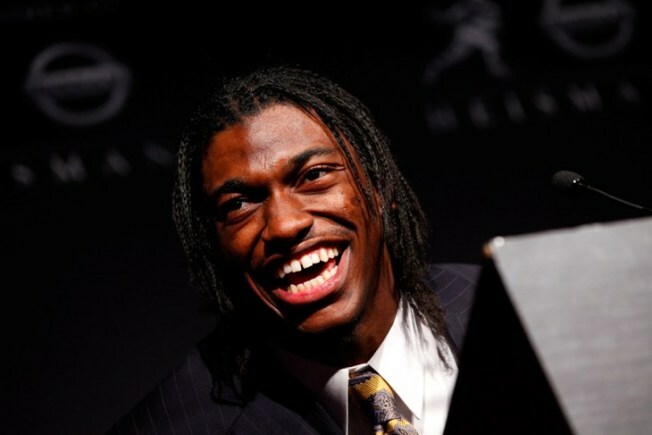 Heisman Trophy winner Robert Griffin III will be signing autographs in the area. Redskins fans are itching for the team to lock down one of the most promising quarterbacks in years, but while you’re waiting you can at least meet the hope of the franchise. Robert Griffin III, aka RG3, will be in Virginia this weekend at the Collectors’ Showcase of America at the Chantilly Expo Center. RG3 will be signing autographs from 1:30 p.m. to 3 p.m.
Last month, the Redskins traded up in order to land Griffin. They traded their first- and second-round picks this year, along with first-round picks in 2013 and 2014, to the St. Louis Rams in order to pick second overall in this year’s draft. Even if you can’t get Griffin’s autograph, there are plenty of other current and former NFL stars who will be handing out signatures. Pittsburgh Steeler’s stars Ben Roethlisberger, Hines Ward and Jerome Bettis will be there. Miles Austin, Franco Harris, Michael Vick, Jason Witten and Matthew Stafford will also be signing autographs.